Get ready for a full day of sightseeing on the 2nd (Sun): take in the spiritual surroundings of Boyana Church, then test your problem-solving skills at popular escape rooms, and then contemplate in the serene atmosphere at The Rotunda of St George (Sveti Georgi). Plan my day in Sofia using traveler tips and tourist information provided by Inspirock. New Delhi, India to Sofia is an approximately 11.5-hour flight. You'll gain 3 hours traveling from New Delhi to Sofia due to the time zone difference. Plan for colder temperatures traveling from New Delhi in June, with highs in Sofia at 30°C and lows at 15°C. Finish your sightseeing early on the 3rd (Mon) to allow enough time to travel to Varna. On the 4th (Tue), take in nature's colorful creations at Botanical Garden Ecopark, admire the natural beauty at St George City Park, and then explore the striking landscape at Pobiti Kamani. Here are some ideas for day two: see the interesting displays at Palace and Botanical Gardens of Balchik. To find where to stay, traveler tips, ratings, and more tourist information, go to the Varna vacation planner. You can fly from Sofia to Varna in 3 hours. Alternatively, you can drive; or take a bus. In June in Varna, expect temperatures between 30°C during the day and 18°C at night. Wrap up your sightseeing by early afternoon on the 6th (Thu) to allow time for travel to Ohrid. Located on Lake Ohrid, the town of Ohrid earned the nickname Jerusalem of the Balkans because it was once home to 365 churches. Start off your visit on the 7th (Fri): steep yourself in history at Monastery of Saint Naum, then examine the collection at National Workshop For Handmade Paper, then take in the architecture and atmosphere at St. Jovan Kaneo, and finally pause for some serene contemplation at Church of Our Lady Perivlepta. 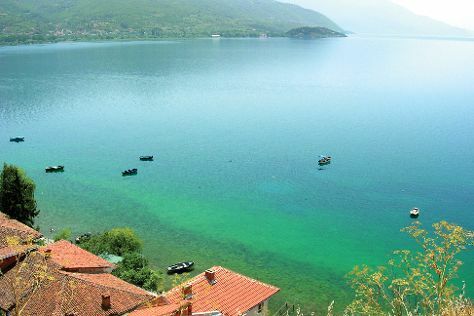 Get ready for a full day of sightseeing on the next day: explore the activities along Lake Ohrid. To find maps, where to stay, other places to visit, and tourist information, you can read our Ohrid online trip itinerary builder . You can do a combination of flight and shuttle from Varna to Ohrid in 9 hours. Other options are to do a combination of flight and bus; or drive. Traveling from Varna to Ohrid, you'll gain 1 hour due to the time zone difference. Traveling from Varna in June, expect a bit cooler with lows of 15°C in Ohrid. Wrap up your sightseeing on the 8th (Sat) to allow time to travel to Athens. You'll discover tucked-away gems like Temple of Poseidon and Agios Nikolaos Church. There's still lots to do: delve into the distant past at Acropolis of Athens, wander the streets of Plaka, admire all the interesting features of Panathenaic Stadium, and pause for some photo ops at Temple of Olympian Zeus. To see where to stay, more things to do, traveler tips, and tourist information, go to the Athens journey maker . Do a combination of car and flight from Ohrid to Athens in 4.5 hours. Alternatively, you can drive; or do a combination of shuttle and flight. Traveling from Ohrid to Athens, you'll lose 1 hour due to the time zone difference. Traveling from Ohrid in June, expect Athens to be a bit warmer, temps between 35°C and 24°C. Finish your sightseeing early on the 11th (Tue) so you can travel to Rhodes Town. Explore hidden gems such as Throne of Helios and Monastery Tsambika. 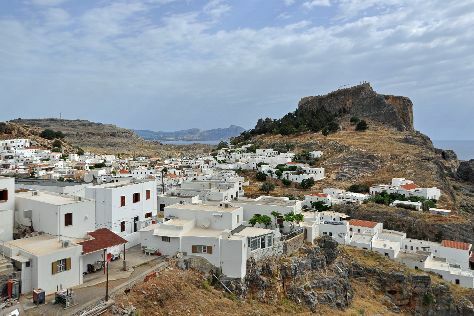 Explore the numerous day-trip ideas around Rhodes Town: Agios Nikolaos Fountoukli (in Eleousa), Ancient Kamiros (in Kalavarda) and Village of Lindos (in Lindos). There's still lots to do: test your problem-solving skills at popular escape rooms, enjoy breathtaking views from Roloi Clock Tower, steep yourself in history at Mandraki Harbour, and step into the grandiose world of Palace of the Grand Master of the Knights of Rhodes. To see photos, ratings, traveler tips, and more tourist information, read Rhodes Town day trip website . Traveling by flight from Athens to Rhodes Town takes 3.5 hours. Alternatively, you can ride a ferry; or do a combination of car and ferry. June in Rhodes Town sees daily highs of 32°C and lows of 25°C at night. Wrap up your sightseeing on the 14th (Fri) to allow time to travel back home.